Chitra Stern, Martinhal Resorts, speaks at Martinhal Luxury Family Brands event. 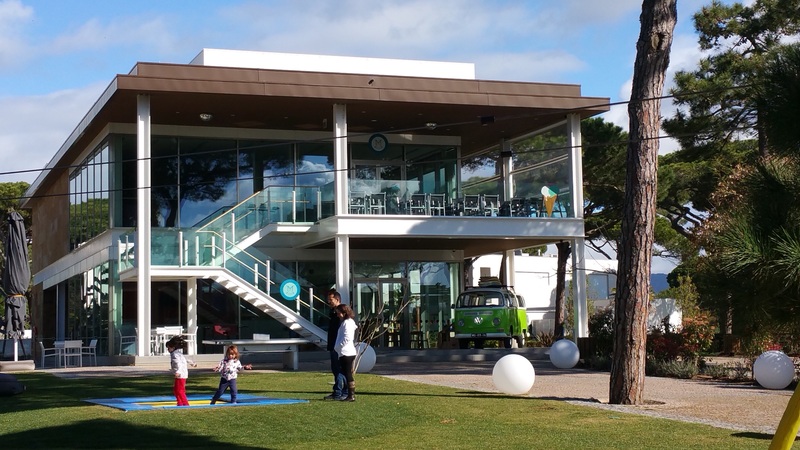 Luxurious, fully equipped kids club at the Martinhal Cascais Lisbon resort, Portugal. The Martinhal Luxury Family Brand Event took place March 24, 2017 in a contemporary space at the Martinhal Cascais Lisbon resort, where floor-to-ceiling windows overlook a children’s play area. Martinhal Family Hotels & Resorts, a hotelier catering to that elusive “luxury family” market with four stylish properties in Portugal, invited about 150 brands, suppliers, friends, travel professionals, bloggers and media to explore the needs of today’s “luxury family” customer. Here’s what we learned from the slate of creative speakers. To start, our hosts, Chitra and Roman Stern, remind us that the brand’s tag line says it all: @Martinhal, parents have their cappuccino with the foam still on it. They’re selling the expert staff, sumptuous service and attention to detail – especially with children — that make it possible for parents to relax while kids have fun. 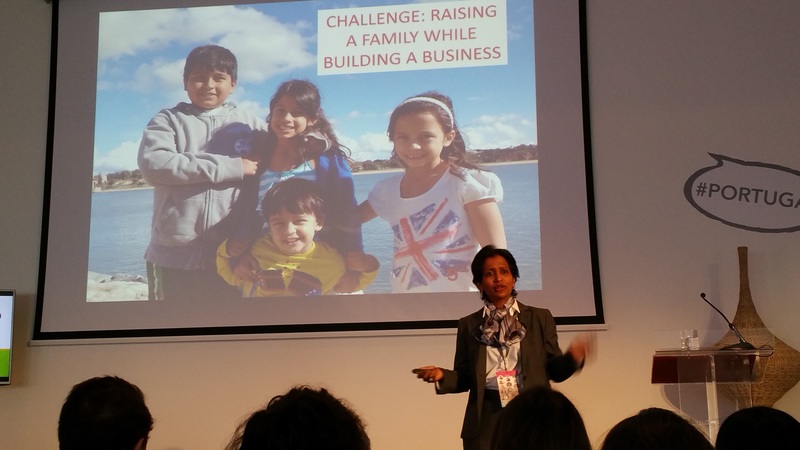 Chitra’s presentation wows the room by aligning the growth of her business with the arrivals of four children. Elsbeth Teeling from The Netherlands didn’t know when she wrote De Club van Relaxte Moeders (Relaxed Moms Club), a humorous and useful tips guide, that it would find 137,000 fans on Facebook. For her, luxury is “being serious about you and making ‘me’ as important as being a good mom.” Her brand delivers “daily doses of laughter” that is honest, relatable and respectful to moms. Mariana Duarte Silva is a mom of three and developer of the Village Underground Lisboa, a once abandoned lot now filled with graffiti’d shipping containers that provide co-working space for artists and light industry. From her point of view, the playground and skateboard ramp where kids can play while parents work is essential. For womenswear designer Prabha Rathinasabapathy, the technologically advanced fabric that sheds odor and wrinkles makes her System of Motion clothing line a win with working moms. Olivia Strigari of Magic Maman magazine said, “Perfection is a nightmare for women,” and asked luxury brands to recognize their customers’ priorities change when they become parents. For founder Christophe Duhamel of Marmiton.org, the promise of his wildly popular food site is, “Helping to cook better and eat better.” Citing the May 1968 cultural revolution in France that encouraged women not to stay home and cook – breeding what he calls the ‘microwave generation’ – Duhamel saw opportunity in motivating the French to cook by making it healthy, easy and tasty; the slow food movement at a greater pace. Duhamel’s success comes from helping his audience wherever they live: online, apps, cookbooks, videos, social media, magazines, retail and Les Journees Marmiton events. Ella’s Kitchen and Paddy’s Bathroom, the U.K.’s leading organic baby food and bath brands, have spun off cookbooks and social impact projects in Africa. “I believe the best businesses make good products and improve the world,” founder Paul Lindley says, reaffirming the mantra of ‘doing well by doing good.’ Rainer Jenss of the Family Travel Association agrees that “every parent wants what is good for their child” regardless of their economic status. The Irish Fairy Door company thrives on the gift of gab of its chief storyteller, Niamh Sherwin Barry, who brings packages of small wooden doors plus a fairy lease agreement to vivid life. “It’s just a piece of wood,” she says, “but you give it to this little person and they have this big imagination and something magical happens and they just explode.” Since their June 2013 launch, they’ve sold 500,000 fairy doors and have lectured at Facebook’s Menlo Park Headquarters. “Cultivate kids’ imaginations,” says Niamh, who’s added a fairy door suitcase to the line so her clients can keep their lifestyles intact on the road. Kinder Hotels began with one hotel in Austria in 1988, and now represents 50 four- and five-star hotels and resorts in Austria, Germany, Italy, Croatia and Portugal selling two million room nights each year. Werner Bilgram, Managing Director of the company’s Family Select Hotels brand, say brand standards are very strict because affluent parents want every option available on vacation. Kinder Hotels’ mountain resorts have dedicated ski areas for kids 2+, for example, and the Kinderhotel Academy trains all childcare staff. All hotels use a licensed baby-swimming program, have pools and waterslides, nurseries for guests one week and older, pagers for parents, and anything else that trends dictate is essential for families, babies or preschoolers. Since well-traveled millennials now plan urban family breaks, they’ve debuted their first Kinder City hotel, the Martinhal Chiado Family Suites in Lisbon, which has family-welcoming kitchens and an on-site kids club. “Grandparents and parents will pay more for a hotel if the quality is evident,” says Werner. As if to prove the universality of parenting, he notes that demand is up from Korea, Oman and Dubai, and that Chinese investors have already duplicated one of the Austrian Kinder Hotels in the Chinese countryside. “We’re all here to make a better, brighter world for children” is the closing statement of Baby Deli founder Vanessa Carlini. The Madrid-based franchise is part café, baby store, part workshops, and childcare in one creative bundle. Vanessa says her clients want things on demand. That philosophy is at the heart of how these creative brands have successfully navigated today’s luxury family market.